This is part 2 of a storyline check out part 1 here. So we meet the Real Brandon this episode. OOOooooo Intrigue. I wonder what happens next. Come back tomorrow for Part 3. I’m really enjoying doing this storyline and I hope you guys are liking it too. it’s going to get really epic real soon. Been trying to reset my sleep schedule. I’ve been working late nights lately and I’ve getting progressively more nocturnal. heh. not that that’s a bad thing but I like mornings. Coffee in the morning is a beautiful thing. Thanks to everyone who’s been voting for I am ARG! and been promoting the comic on forums and such. I really appreciate the help. It’s more genuine when the promotion comes from fans. So again thanks. You’re helping me to really keep this comic going strong and making me really think and work this hard. I got a question for you guys. Does anybody know of a really good online polling service that I can embed into a blog post. I wanna start polling you guys for your reactions on things. Besides the comments and twitter I wanna reach out to you guys more. Like i said before you can follow my twitter. I’m pretty good at responding to people’s @mentions, so don’t be afraid I dont bite. heh. also I’ve been posting more and more warm up sketches on my deviant art. I started to draw Video game vixens but I’m gonna start branching it out to any geek sort of thing. I just wanna say, you look badass with the scar and the whole ‘weathered’ look. You look kinda Norse, actually. Nice throne you have there. Goes well with the torches and pillars. Perhaps a couple of guards to stand around would’ve been a good investment? That way any strange and gruff looking imitatation of yourself cannot just waltz in? I’m saving the guards for the remastered directors recut edition where I shoot first, all the guns are flashlights and there’s a super imposed Hayden Christiansen over every panel. That looks a lot like my dad chair! New to your comic, and I love it. 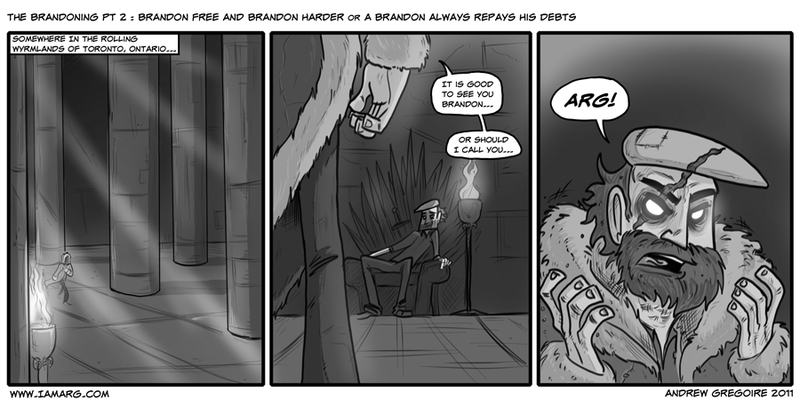 Awesome Game of Thrones reference.